The technium began before humans began. But for most of its life technology has been ignored. It did not even have a name until recently. No one was sure what it was, what it did, and what it meant. For most people today, the word “technology” suggests iron mills, telephones, chemicals, automobiles, silicon chips and a solid mass of cold stuff. We can almost hear the hard ring of steel in technology’s hard guttural consonants — tek. But that is not how the name started out three thousand years ago. “Techne” was the ancient Greek term for the act of giving form to matter, for making a pot out of clay, or a table out of wood. It is what we might call craft, although it meant more than simple handiwork. It was craftwork with a spirit of invention, more like art. The Greeks said artisans and technicians shaped wool into sweaters, marble into ornaments, iron into axes and silver into jewelry. The craftsmen’s “techne” reflected the work of their hands, but also their genius, that bit of an artist’s spirit that was breathed into the clay. Techne was a noble act unique to humans. But from the very beginning the ancients were confused by crafty things. Did these ideas made concrete exist by themselves? Or was the true meaning of an artifact entirely borrowed from the artist? The ambiguity about craft was widespread among the pantheon of Greek philosophers. Plato, like most scholarly gentlemen, thought that crafts were base, impure, and degraded. Even the nicest bed made by a carpenter was less that what an ideal bed could be. But at the same time, Plato was fascinated by the stunning ingenuity of craftsmen. They seemed to put the gods to shame, and they knew “many and good things” In the book Gorgias, Callicles complained to Socrates that Plato “never stops talking about cobbler, fullers, cooks and doctors.” Socrates, Plato’s teacher, believed that an artwork was entirely animated by the hands of the craftsman and was therefore only an incidental trifle in the grand theory of things. In Roman times invention continued to rate no more attention or praise from the intelligentsia beyond a fascination with novelty. Posidonius claimed that it must have been a wise philosopher who first invented tools, to which Seneca replied that it was not philosopher at all but a mind staring stupidly at the ground. But in fact the role of artifacts was a fairly minor worry in the Greek and Roman’s grand intellectual efforts to erect a universal logic of thought. Because of his contempt for practical knowledge Plato omitted any references to craft in his elaborate classification of all knowledge (that is all speculative knowledge). He would dwell on the details of weaving but only as the substrate for an ethical point. Knowledge of weaving was nothing itself in his scheme. The problem with crafts according to the Greeks was that techne addressed utility but not purpose. Utility per se ranked below entertainment as a virtue. The philosophers wanted to know “utility for what?” Techniques (techne) were pure potential. What would morally guide this potential? Thus the manufactured world was overlooked by the classic philosophers in their otherwise comprehensive exploration of the known world – an oversight that would guide investigations for the next two thousand years. Aristotle, Plato’s student, did not have much to say about craft but did speak about art, which he perceived as the act in which something “comes-to-be.” He classified craft as a “productive art” – again that taint of utility. Crafts were simulations of nature; study nature and you study all. The one exception to the consistent inattention towards the creative efforts of invention is recorded by Aristotle in his essay Rhetoric, where he addresses the techne (craft) of rhetoric. In a humdrum passage on grammar Aristotle for the first time marries the Greek terms techne and logos into the word technologia. But it isn’t exactly clear what Aristotle meant the four times he used this new word, technology. Did he mean the craft of words, or words about craft; did he mean speech concerning art or the art of speaking? The Greeks and Romans were no slouches in discovery. Their contributions to the library of great inventions is significant and celebrated. As early as 600 BC the Greek flywheel and coloring techniques made their pottery the envy of the Mediterranean. The first world map was charted by Anaximander. The Greeks added welding iron, bellows, the lathe and the key. The Roman list goes on for hundreds: the vault, aqueduct, blown glass, cement, sewers, water mills and so on. Yet in their own time and for many centuries thereafter, all that was manufactured was virtually invisible. Every decade there were brilliant men and trade secrets; there was no larger context for the proliferating genius. Technology could be seen everywhere in the ancient world except in the mind. In fact, Aristotle’s coinage “technology” was abandoned after classical times to the footnotes of obscure texts. In the centuries following, scholars continued to call the making of things craft, and the expression of inventiveness art. As the importance of tools, machines and contraptions increased, this realm of craftwork was termed the useful arts, influenced greatly by Aristotle’s term productive arts. Each useful art — mining, weaving, metalworking, needlework — had its own secret knowledge passed on by an apprentice/master relationship. But it was still an art, a singular extension of its maker, and the term continued the original Greek sense of craft and cleverness. 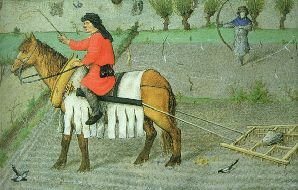 By the European Middle Ages, personal ingenuity was birthing significant cultural artifacts. Never before imagined awesome cathedral architecture, innovative music and literature, and bold inventions in weaponry seem appear out of nowhere. But techne manifested itself most significantly in a new use of energy. An efficient horse collar had disseminated throughout society, drastically increasing farm acreage, while water and wind mills were improved, increasing the flow of lumber, flour, and drainage. And all this plentitude came without slavery. As Lynn White, historian of technology, wrote, “The chief glory of the later Middle Ages was not its cathedrals or its epics or its scholasticism: it was the building for the first time in history of a complex civilization which rested not on the backs of sweating slaves or coolies but primarily on non-human power.” Machines were becoming our coolies. With autonomous power sources came clocks. Clocks framed a clockwork perspective, dividing up time into regularity. Clockworks found their way into all kinds of contraptions; they gave a heart and mind to machines. More than any other invention, self powered clockworks suggested that all manufactured things might share a common name. By the 1800s the world was rapidly filling with new techniques and new ideas which were upsetting the established order – the American and French revolutions, the Enlightenment. But as yet, this new thing that crowded peoples lives, intruded into farms and homes and growing cities had no name. As every tribal society knows, a name gives power. To name the invisible makes it seen. In 1829 a Harvard professor named that which was surrounding us which had no name. 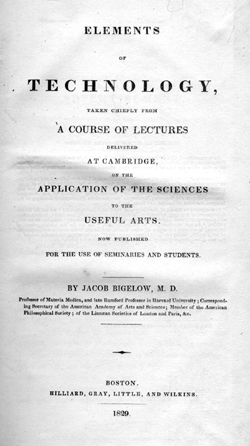 James Bigelow presented a series of lectures in Cambridge Mass. on the useful arts in which he argued that their increasing utility in our society demanded that we both teach and research them in a systemic way. He called this collective knowledge TECHNOLOGY, a resurrected Greek name. In a book called The Elements of Technology he outlined in encyclopedic fashion the primary facts in each field of technology (mining, engineering, chemistry), a catalog of techne. He hoped this outline would become a syllabus for the first course in the subject. This page reproduced here is the christening of the technium. Technology – that expanding body of ideas made real – is named. We can now see it, and having seen it, we wonder how anyone could not see it. And having seen it, we wonder what it wants. This could be a book, yet your brevity here makes the essential concepts more powerful. With elaboration, it beomes a book about everything. In the brief form, this is a very stimulating and provocative essay. Well it IS part of a book, and it may yet “expand”, but thanks for the compliment. It is interesting to reckon stories about how some heroic character handles a difficult situation in a novel way. Techne is a nice word to suggest the development of a more artful or functional solution than those tried before. I’ve sought to reckon the spectrum of solutions that arise, beginning with the old classics, Fight and Flight, and progressing to the increasingly cunning, artful, functional, ingenious, and spiritual. On the left end of the spectrum are the high-energy adrenalin driven responses. In the middle are found somewhat lower energy solutions mediated by other neuropeptides, including gastrin and bombesin. Toward the right are increasingly subtle solutions mediated by dopamine, serotonin, and endorphins. Where would you put politicians like presidents and other world leaders? Where would you put technologists? Where would you put philosophers and journalists? Where would you put spiritual leaders? Where would you put yourself? I find no indications of any mention of “technologia” in Rhetoric. Which text and in what specific section are you looking in? Did you mean Poetics?